The Wheel of Fortune tarot card represents karma but also balance, movement, and the cycles of the cosmos. It is said that everything in the universe happens for a reason. The Wheel of Fortune tarot shows how this principle works and why. The wheel in the center of the Wheel of Fortune tarot card is inscribed with the Hebrew word for god, YHVH, and the Latin word for wheel, rota. The spokes form two equal armed crosses, symbolizing balance. This wheel on the Wheel of Fortune card is in constant motion, because someone is always doing something somewhere. Karma is a Sanskrit word, meaning “action” or “deed,” and every action has an effect. The three beings around the wheel explain how it works. The sphinx on the top of the wheel represents wisdom and equilibrium. The sphinx on the Wheel of Fortune tarot asks us to consider life’s riddles and seek the answers to them. Therein we can find our true balance. The serpent Typhon, the destroyer, descends the wheel on the left of the Wheel of Fortune tarot, while the Anubis, the Egyptian god who leads the souls of the departed to the afterlife, rises on its right. Painted on the Wheel of Fortune tarot card in the three primary colors, these figures are part of the same complete cycle. With enough planning, you can predict and control the outcome of your actions. The actions of all physical and spiritual beings combined keep the universe in motion, and this motion is both, cyclical and self-balancing. Sometimes these cycles work in our favor, and sometimes they seem to work against us. The winged beings in the Wheel of Fortune card’s four corners (four of the Five Elements) are outside forces that can help or hinder us. However, given that their symbols correlate also to Zodiac Signs, it must be considered that we have natural internal forces which we have to work our way through. The open books on the Wheel of Fortune tarot card symbolize that they are conveying messages from the divine source. They are seated on clouds, meaning that they are divine beings themselves. While the energy in the Wheel of Fortune tarot is experienced physically, the fact that these being are yellow shows that it can also be understood rationally. You’re not being kept in the dark. Therefore, it is important to learn how these cycles work and plan your actions accordingly, so use them to our advantage, just like an experienced sea captain knows how to set his schooner’s sails to cruise against the wind. The traditional interpretation of the upright Wheel of Fortune tarot card, that the cosmic tides are in your favor, certainly agrees with the card’s overall symbolism. In a universe that is in continuous motion, the only constant is change. Money comes and goes. Youth blossoms and fades. That is why many child actors vanish into obscurity as they grow older. There is no shame in being lucky. However, even the best luck can run out. The lesson here is to plan your next step while you are enjoying your current stroke of luck. Here is something else to think about. While outside forces greater than you and lucky circumstances are showering you with blessings right now, it can help to focus on the ways in which you have contributed to your own good fortune. Very few things in life ever happen without your having some part in them. It’s not just a matter of giving yourself enough credit. Knowing and understanding your share in what is happening to you will help you reap the greatest possible benefit from this and future cycles of plenty. Remember, The Wheel of Fortune tarot card is, at its core, all about karma. Bear in mind that the planet Jupiter is associated with The Wheel of Fortune card. While Jupiter is known for his generous nature, the fact that he is also connected to the law of attraction is equally important. This energy showers the wealthy with riches and the strong with strength. What do you think it will bring to an insecure and miserable person? The good news is that cultivating a sense of honest pride in your achievements and true gratitude for your blessings can do wonders to raise your self-esteem and further perpetuate your own circle of success. 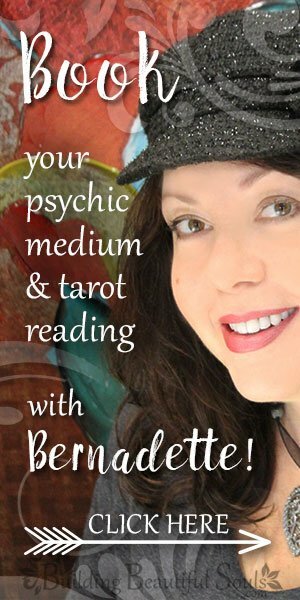 When the Wheel of Fortune tarot is reversed in a reading, it is a good idea to postpone a major change that involves risk taking. Forces beyond your control may have temporarily, but unexpectedly diverted important resources, or a sudden crisis may demand your immediate attention. But whatever challenge may present itself, it too shall pass. Here, it is crucial not to turn a mole hill into a mountain. While it’s always useful to take responsibility for your share, it is just as important to avoid blaming yourself unnecessarily or excessively. What you’re experiencing is part of a biological or cosmic cycle, like a crossover day on your biorhythm chart, which can upset your emotions, or an astrological event, such as a Mercury Retrograde, which can garble important communications. “Deserve” or personal karma plays into it only to the extent that you are willing to learn from your experience and are applying what you have learned from similar past events to the current situation. This is also a powerful opportunity to tap into hidden strengths and inner resources you may not have known you possessed. 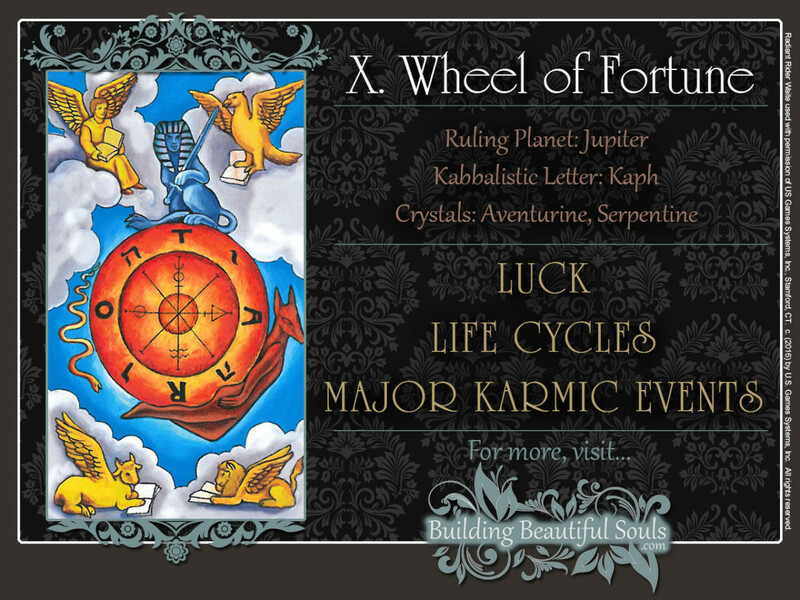 When the Wheel of Fortune tarot appears it is certainly a good time to explore new ways of doing things, if the same approach has led to failure in similar past instances. Remember that insanity is defined as repeating the same thing but expecting different results. Throwing your hands up in despair and capitulating is the worst thing you can possibly do at this time (maybe ever). Not everything you do will be crowned with success, but not even trying is a sure fire recipe for failure. The most successful people in history have experienced many failures during their lifetimes, but they learned from them and kept trying until they succeeded. Pay close attention to what is happening in your life when you see the Wheel of Fortune tarot card. Look for the underlying pattern. Take stock of your resources, and do whatever it takes to ride this storm out. The Wheel of Fortune tarot is the tenth Major Arcanum. The number 10 symbolizes the completion of one full cycle and the beginning of another. The Roman numeral X illustrates this beautifully. It’s actually a hieroglyph for a sheaf of grain. The Number 10 is actually the Number 1, but vibrating at a higher frequency (1+0 = 1). For a better understanding of The Wheel of Fortune tarot card, read the in-depth description on the Numerology meanings of the Number 1.